Along with the Rhino rather than Razorback approach (though the hatches can still take the guns, if needed) I needed a few more troops to bulk out the Grey Hunter Squads to 10 each. as the last lot were quite feral and armed with melee and bolter, I decided to build these guys with a little more restraint, as such they are more classic bolter pose marines. I tried to keep some dynamism though, and blended with the other fellows I think they'll be okay. for special weapons I’m mixing it up, some squads with melta, some with plasma. I also went with power weapons rather than the mark of the wulfen. I know wulfen is more efficient, and maybe I'll model some up down the line,but for now, it’s power weapons. I’m keeping the wolf banners though. So essentially I’ll have enough marines for- 2 x squads with 2 melta, power weapon and wolf banner. Very nice posed hunters there sir. 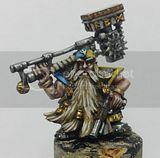 For Wulfen, why not just give them 2 power weapons or knives to represent the rending and mass of attacks?